Wait! Before you slather, even if you are careful about choosing the labels that says, “natural” or “dermatologist recommended” …read on. If you are like most Americans, (80%) you buy sunscreen to help prevent skin cancer and sun damage, thinking you are doing a good thing. According to most dermatologists, we are. But…are we actually subjecting our bodies to toxic chemicals that not only could harm us…even be damaging our coral reefs? Recent lab tests by the Silent Spring Institute in Massachusetts (they investigate environmental links to cancer) show that even when they tested sunscreens labeled as “natural” they found a total of 24 toxic chemicals. (Conventional sunscreens tested much higher, as you may expect.) Many of these chemicals are absorbed through the skin and can be detected in urine, blood and breast milk samples. On top of the toxic list is something called Oxybenzone. It is a proven hormone disrupter and may cause skin irritation as well. According to Medical Daily, in 2016, studies revealed that 80 % of women suffer from some sort of hormonal imbalance. It may be hard to fathom at first, that a seemingly harmless cream could worsen hormone issues, but it has been proven, and it’s not worth the risk. As if that’s not enough to have us sort through the tubes in our beach bags, the damage from Oxybenzone doesn’t stop with us. The effects on coral reefs in Hawaii, Australia and the Caribbean are alarming. Vacationers that slather the lotions on before they go swimming have increased the level of the chemical considerably in the last decade and this is no small threat. Oxybenzone harms the DNA of both young larva and adult coral, resulting in hindered development in one of the most fragile environments on earth. It may be hard to fathom that something as large as a whale could feel the repercussions of the chemicals in our relatively tiny tubes of skin care, but they do. 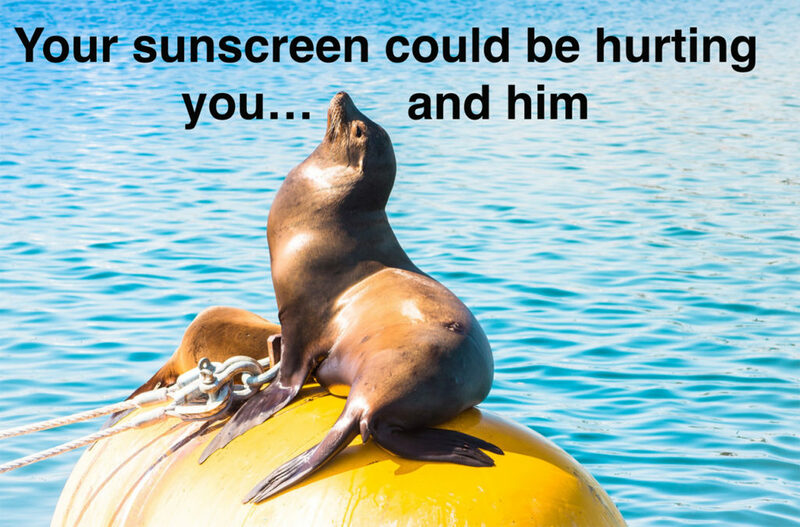 Sunscreens affect the quality of sunlight that reaches the Phytoplankton causing the deaths of whales and other species that eat the tiny plants for dinner. This is a serious threat, with Americans buying $400 million dollars worth of potions, lotions and sprays to combat skin damage, cancer and wrinkles. We can make a difference and make healthier choices for our bodies. No matter what your selection, reapplication is always necessary to maintain protection for hours at a time. Read your labels and feel free to reach out to me and I’ll share my personal favorite sunscreen that is mineral based and safe!